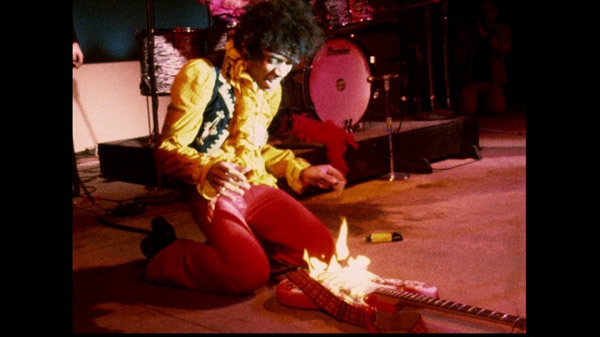 Jimi Hendrix lit his guitar on fire. Because of that, I’m changing my life. 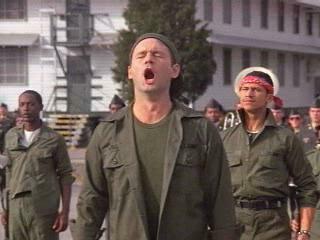 If the 1981 movie Stripes wasn’t enough of an inspirational front-load for my own military service, it also serves as one of the most memorable scenes in what I would call a “Johnny Paycheck Vaporlock.” Bill Murray’s character, John Winger, is a work-a-day cab driver, who, after taking the final straw of verbal abuse from a patron, stalls the car on a bridge in rush-hour traffic and walks away. Aside from the perceived and immediate gratification we’ve all felt about this scenario via workplace angst, there is an underlying positive behind the abruptness of the scene. John Winger decided. Today is the day I’m changing things. In a previous post, I covered the now-viral clip of Jim Carrey’s admonition to graduates, that “caution can simply be fear masquerading as practicality,” and that we will all struggle with the possibility of failure—even at things we disdain. Could be me, but I’m sensing a theme. Somewhere along the line, we’ve adopted this algorithm that states we are to slave away in an 80/20 capacity—80 percent of our lives we invest in a retirement that we HOPE can be spent on a 20 percent—right up until we die. And that’s assuming we live long enough to balance that equation. This is hogwash. And I don’t know about you, but it’s time to take this algorithm and its mindless proponents and show them the door. Make no mistake, this isn’t an “all play and no work” philosophy. This isn’t an advocacy for some utopian, Parisian work week with naps and wine. I’m talking about living. Right about now. “If I was raising grass, I’d be concerned,” I said. Looking back over the last few years, I realize I have been at times as myopic about useless minutiae as he was. I’ve allowed the dumbest things to circumvent moments with my own family. My kids. My wife. All because I’ve adopted the world’s greatest hoax—I’ve heaped the world’s most appalling onus upon my own back. And I for one have had it. This all started coming to head when my family and I traveled to a nearby city for a concert. On the way home, we stopped at an estate sale. That’s right. We basically engaged in the organized, compensatory looting of a dead woman’s home. My daughter bought an old Kodak movie camera. What was perhaps once a raging vortex of sentimentality—now shot into the ether—now in the hands of a child she never knew. In a moment, it went from grand pedestal, to teenage junk drawer. All. Because. She. Is. Gone. Use it. Take that stuff of the shelf and use it. If it breaks, guess what? That’s right. The world continues to spin—irrespective of declining resale value. I don’t care if someone gives me a vintage, last-one-on-earth Rolls Royce. I’m driving it into the ground. They can hand me a vase from the Ming Dynasty. I’m putting it in the kids’ room. A first edition, signed copy of Huckleberry Finn? That’s right. I’m reading it. I’m even cracking the spine because I laid another book on it to “pin it open.” I don’t want to read a newer copy, because I have this one. Now. All because one day I’ll be gone. Look at how perverse this really is; Supplanting the real priceless artifacts in our lives—our loved ones—in the name of laying up in store for a rainy day. Then,the rainy day comes. And that rainy day fails to meet the standard. Let’s stock up on some more stuff instead. We’ve deified the artifacts that can be resold—in the name of desacralizing that which we would never. That mindless, soul-sucking job—robbing you of your last vestige of goodwill? Out with it. Leave. Take that infernal, potential-robbing cancer OFF of the shelf and put your KIDS on it. If you have to pull a logistical DB Cooper to make this happen, do it. Just politely grab the loot, the gun, excuse yourself and make the leap. The Sierra Nevadas are waiting for you. Not your detractors. YOU. The $1,600 acoustic guitar I’ve babied? I’m beating it to death. I don’t care if it looks like Willie Nelson’s nylon-string has-been by the time I’m dead. It was made to be throttled into sound—and that happens when we decide to wrench from it that for which it was made. For potential. Kind of like us, huh? Jimi Hendrix’s positive influence in my life was always confined to his fearless guitar work. The rest of his life—and especially his nihilistic expiration—has always been the point of departure; it has always been the cautionary tale of excess. But the moment he torched his Stratocaster at the 1967 Monterey Pop festival does have a takeaway. Temporal over eternal. Whether or not that was Jimi’s point, we’ll never know. But his willingness to disconnect from his material Doppelgänger is instructive. In fact, I’m hoping one day, Itzhak Perlman is ricocheting that bow off his 300-year-old Stradivarius violin, playing Paganini’s 24 Caprices, and then suddenly stops, looks at the audience, and says, That’s it. I’m done. Gandkids are waiting for me in the truck. Goodnight Dallas! Then shoves the Strad scroll right through the monitors, and bounces out. I’m running with the distilled Jimi; Torch the misappropriated priorities, and let’s get on with it. This entry was posted in Guitar, Music, Uncategorized, Writing and tagged Bill Murray, Blogging Advice, decluttering, Huck Finn, Jimi Hendrix, Mark Twain, novel writing, publishing, Self publishing, Warren Barfield, writing. Bookmark the permalink. 4 Responses to Jimi Hendrix lit his guitar on fire. Because of that, I’m changing my life. I once heard the line, “You can grow a lawn or you can grow kids.” I choose to grow kids. Our house basically sits on a sand pit. It’s great for my leach field, but not so great for growing grass. My children, with their bikes and their running around, add to my dysfunctional lawn. My cousin, who grew up in a family of seven boys, told me he always thought the grass that did survive at their house was of the hardy variety and deserved to grow. The second thing I thought of was something one of my favorite authors, Henri Nouwen, wrote about. He wrote about the various illusions we accumulate in our life, and one of those was the “illusion of immortality.” He said we endow material things with “immortality” thinking they will last forever, and neglect the things that really are immortal. He develops this thought much more than I can in this short comment, and what you wrote reminded me of this. I recently gave my notice at a job I really don’t like that well. I gave them a seven-month notice since I am still accumulating supervised clinical hours through this job. However, by December I will have all the hours they can supervise for me. The only reason to stay on is for financial reasons and for health insurance. These are not big enough motivators for me to continue to work at a job I really don’t like or find much satisfaction in. I told them if they could not move me somewhere else within the agency then I would look for another job. I felt good about that decision. I have some other decisions to make in my life, and that was a good first start.